But see ZWD comment at the end. “The 42 Fire Tenders and the full story behind it”. In his address to the second session of the eleventh National Assembly on September 21st 2012, President Michael Sata promised to bring and deliver development to Zambia’s communities through resource allocation to all districts and all constituencies. President Sata regretted that lives and property were lost to fires. He also gave his vision that he intended to allocate a fire tender to each district(which were now 100 from 73). In the subsequent budget presented by Minister of Finance, Alexander Chikwanda, under local government, Government proceeded to allocate among other things, $45million for the procurement of fire tenders, rescue equipment and safety services. To this effect, Ministry of Local Government and Housing entered into a Memorandum of Understanding with Albion Export Services U.K to supply fire tenders and rescue equipment to all local authorities (100) at a cost $168million. 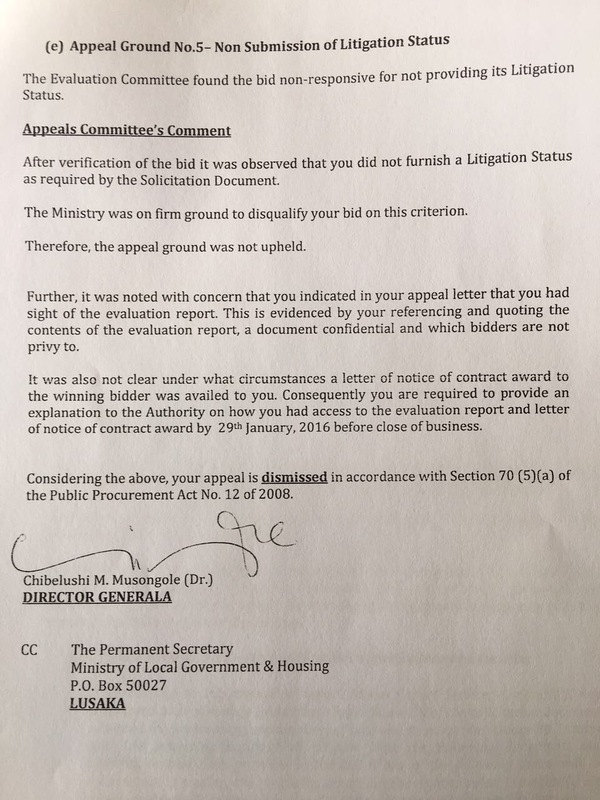 But in his letter to the Permanent Secretary of the Ministry of Local Government Housing (Early Education and Environmental Protection) the Attorney General, Mumba Malila in his letter dated 25th March 2013 reference /101/7/6, rejected the MOU as it didn’t not comply with the Zambia Public Procurement Authority Act. And ZPPA advised that the scale of the project required that an open and public tender was sought. At this stage the procurement of fire tenders and safety equipment was subjected to internal scrutiny and experts designed the type of fire tenders Zambia would need. In June 2015, In his letter to the Permanent Secretary Ministry of Local Government and Housing, Secretary to Treasury Fredson Yamba informed the Ministry that his office had decided that the project be broken up in phases to reduce impact on the Treasury and that would therefore provide funds for the first phase of the project. He also directed that the instructions by the Attorney General to comply with tender procedures as provided for under the ZPPA Act was complied with. This process attracted over 15 companies including Albion Export Services. The prices ranged from $36m-$49m for delivery of the 42 trucks. The Ministry had also specified type of fire tenders and service equipment required on each fire truck . On 22nd December 2015, Ministry of Local Government awarded Grandview International Ltd a contract to supply 42 fire tenders and safety equipment at an award sum of $42million. But Albion Services disputed the award and appealed to the Zambia Public Procurement Authority(ZPPA) objecting to the award and claiming that since they had put up an unsolicited bid in 2013, they had incurred costs and wondered why their bid worth$49million for 42 fire trucks was rejected. To this effect the ZPPA halted the entire process until the appeal process was attended to and concluded. Another anonymous complaint report was submitted to the Anti-Corruption Commission(ACC) for investigations. On 18th January 2016, the ZPPA rejected the appeal from Albion Export Services and dismissed all their grounds of appeal. Director General wrote that the appeal was dismissed in accordance with section 70(5)(a) of the Public Procurement Act no 12 of 2008. On 25th January 2016, the Ministry of Local Government informed Grandview International that all complaints and review by the ZPPA had cleared the project and gave the company authority to proceed with the supply and delivery of the fire trucks and associated safety equipment. The contract also provided for the supply of back-up and service parts. The allegation that the contract is overpriced arises out gross ignorance over the cost of these machines. 2. The Civil Aviation bought 10 fire tenders for similar amount for the provincial airports. The Ministry of Local Government bought custom made fire tenders with unique features. ZW NOTE: this document was authored and sent to us by a govt official whose name we shall withhold. 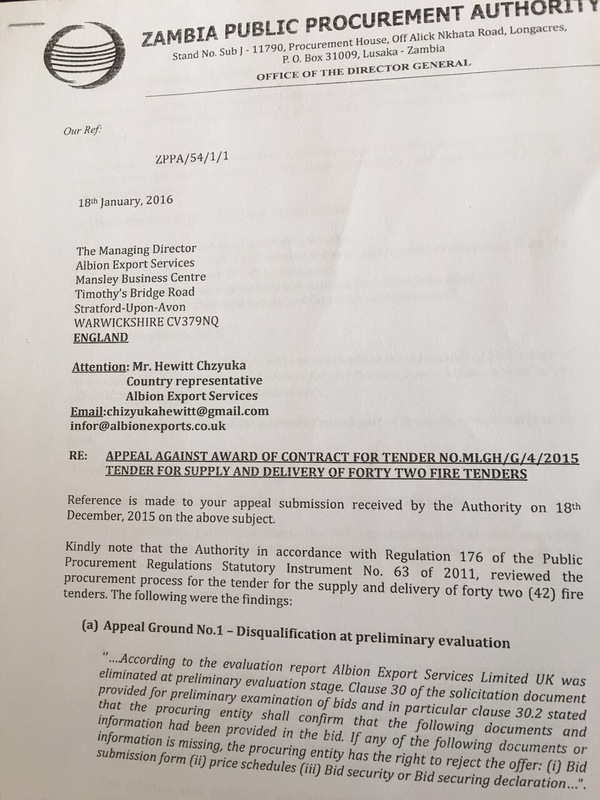 Meanwhile, the Watchdog understands that Albion Export Services of UK which was awarded the tender at first as alluded in this article has successfully sued the Zambian government at an international Arbitration court. We understand the arbitrator has ordered the Zambian government to pay millions of US Dollars as damages to Albion.